Thousands of years ago, the Earth was a battlefield. These were the wars that would shape man's destiny - terrible conflicts that began lifetimes earlier on another planet. 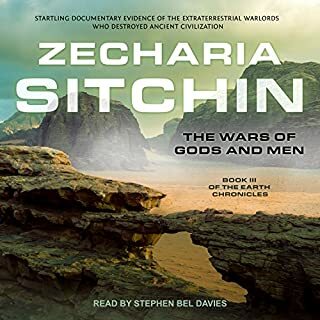 Parting the mists of time and myth, the internationally renowned scholar Zecharia Sitchin takes us back in this volume to the violent beginnings of the human story, when gods - not men - ruled the Earth. 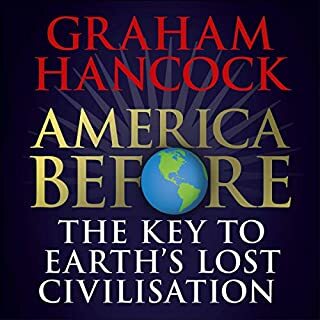 In a spellbinding reconstruction of epic events preserved in legends and ancient writings, he traces the conflicts that began on another world, continued on Earth, and culminated in the use of nuclear weapons. Since earliest times, human beings have pondered the incomprehensible questions of the universe, life...and the afterlife. Where did mortal man go to join the immortal Gods? Was the immense and complex structure at Giza an Egyptian Pharaoh's portal to immortality? Or a pulsating beacon built by extraterrestrials for landing on Earth? 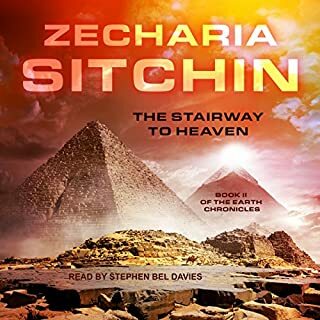 In this second volume of his trailblazing series The Earth Chronicles, Zecharia Sitchin unveils secrets of the pyramids and hidden clues from ancient times to reveal a grand forgery on which established Egyptology is founded. 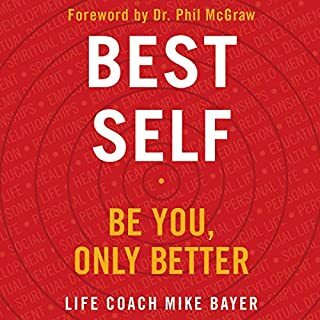 Now on audio! 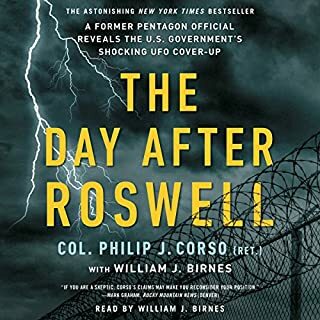 The best-selling exposé that ends the decades-old controversy surrounding the infamous and mysterious crash of an unidentified aircraft at Roswell, New Mexico, in 1947. What did you love best about Chariots of the Gods? The story is engaging and many a facts presented will make you yearn to corroborate from other sources. Much of the info is dated and the fantastical conjectures are not very believable every time. However it is the enthusiasm of the author and well translated by the reader which makes things interesting and not to mention that the authors thesis may be true to some extent as many of the Herculean feats betrays a higher intelligence in play. The amazing mathematics of the Giza pyramids and Mayan astronomical finesse cannot be attributed to tribe intelligence, if so where has this intelligence disappeared, as no doubt with all the modern scientific capabilities much of these architectures cannot be replicated. 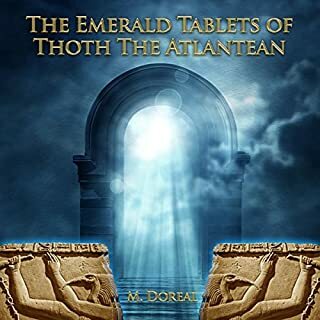 What other book might you compare Chariots of the Gods to and why? 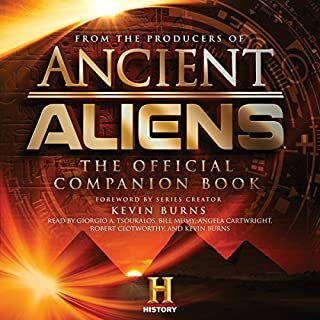 To all the readers who might be interested, I will gladly suggest books by c.k.quartermain and Dr Patric Heron (few of ken johnson's) esp those related to aliens, ufo and nephilim etc which presents a similar case with a dramatically different flavour and replete with scriptural - historical cross-references. If you like chariots of god you will not fail to appreciate the solid thesis of these authors. 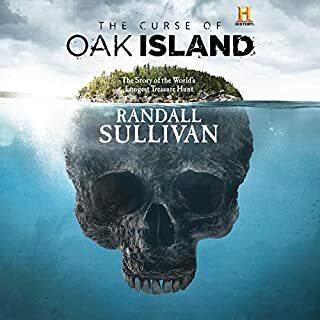 Works of these authors are also available in audible. This book is a pioneer work and should be read by all who get a nagging feeling about the incongruencies in ancient history. But beware the stuff in the book are mostly opinions and in the current times much more scientific & archaeological clarity is available freely on the Internet. Answers? No. But if you wish to think it's great! If you could sum up Chariots of the Gods in three words, what would they be? What was one of the most memorable moments of Chariots of the Gods? The general question...Why/How did our ancient ancestors on nearly every continent just CHOOSE to do things completely without reason or logic if other forces were NOT at work and yet have such similarities? No scenes as this is a book of theories. Extreme reaction? No - but certainly fed my fire for answers of the "Big Picture" even more. I've read a few dozen reviews about what people like & don't like about this book. 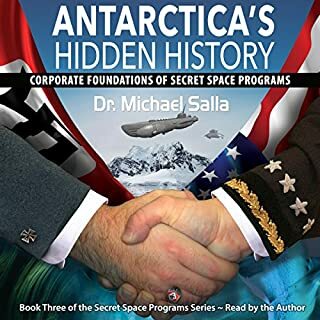 I can agree with some, disagree with many others, but in my personal opinion what most of the reviews have in common that I believe is incorrect is the expectation that the author/researcher produced THE handbook with answers to the many mysteries of the 3rd planet from the Sun.I believe the author is just trying to get others to think about the same things and curiosities that the author himself found to be worth the time to correlate and explore knowing that no answers can be given. Just offering many more questions and how nearly all cultures from all over the globe have such similar things during a time when getting from one place to another took days, weeks, months, etc. And yet how much the varied people of the world have in common at the roots of their own cultures background.Also - this book was written about four decades ago and much has been learned since. Even more striking to me personally is how much has NOT been answered or determined in that same period of time. Is it because we as the race of humans cannot figure it out, or are their other forces making sure we do not learn truths that are not the generally accepted "truths". I was raised Catholic and in my lifetime I've learned personally just how much the church as an entity does NOT want people to know anything other than what a collected group of plain old human beings decided is what we SHOULD ONLY KNOW & TOLD TO BE THE ONLY TRUTH centuries after the Gospels and Bible were written by other humans who were there for the new Testament and some bits or the old Testament and to question is tantamount to blasphemy. Why should ANYTHING that was written by those who were writing about their personal experience in the time of Christ be edited, revised, or even omitted? Since this IS TRUE, how much else do the powers in control of the people of this planet not want us to know? I've always had a soft spot in my heart for von Daniken and his books. I read this book originally when I was very young. I thought it was interesting and inventive and lead me to read the rest of his books as he's written them. It also lead me to sample other books of alternative history, all of which has given me a better perspective of the world. 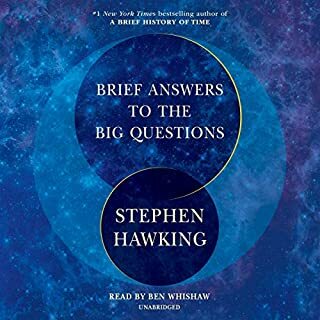 I don't think you have to agree with his conclusions to like the book, but it should help you learn how one individual began to ask questions of the world around him when the answers he was receiving weren't personally satisfying. 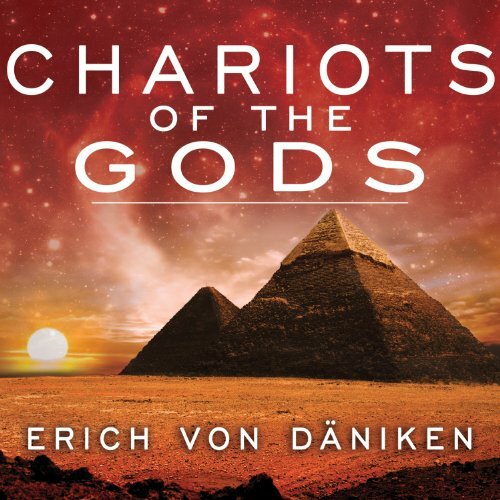 Would you try another book from Erich von Daniken and/or William Dufris? No I don't think so. I learned of him through Graham Hancock's books and also through Coast to Coast AM on the radio at night. 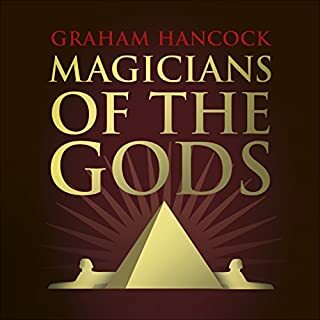 Would you recommend Chariots of the Gods to your friends? Why or why not? No I don't think so. Too many of his conclusions have been questioned and overturned about specific items of proof in archaeology for his claims of ET contact in the past. Von Daniken was a visionary in his time but too many problems with him including convictions for fraud and some prison time. 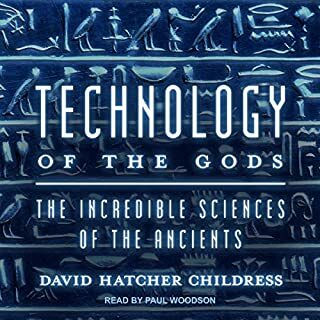 Did Chariots of the Gods inspire you to do anything? NO. Other than read some more modern books on this subject. Erich Von Daniken like or loathe him is enthusiastic and believes what he is saying. 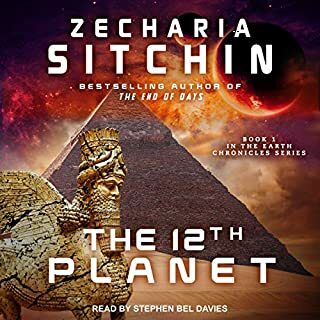 The audiobook is easy to listen to and an example of just let the topic draw the listener in and let all the other theatrical ploys be very minimal. William Dufris injects Mr. Von Daniken's enthusiasm into the read and even when I didn't agree with everything I went away feeling.... like I listened to a motivational tape. The future seemed exciting! 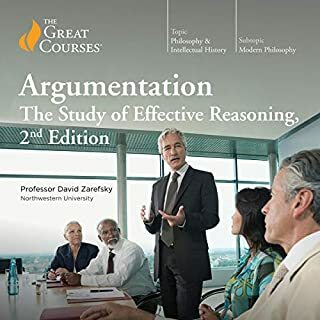 As with any review on topics like this it comes down to sticking to one topic long enough to get all of the information,theory and evidence out. Mr. Von Daniken doesn't do that but the foreword does "clean up" a lot of the past arguments and greatly adds to the book. Great read. 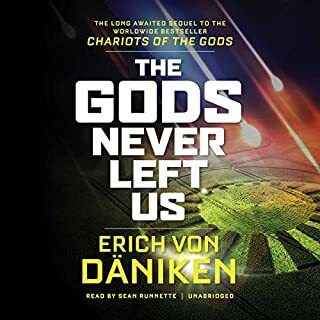 Where does Chariots of the Gods rank among all the audiobooks you’ve listened to so far? Well, it's nothing like any of the books I've listened to so close to the bottom. But I loved it. For me, just the overwhelming sense of: "wow.. thinking on a cosmic level like this is a totally new feeling. I'd never looked at things in this light!" What aspect of William Dufris’s performance would you have changed? He was a little dead pan most of the time. I'd lighten his tone a little. "The history they DON'T teach you in school"
Really good listen, if you're mind is open to new ideas it's really worth it. 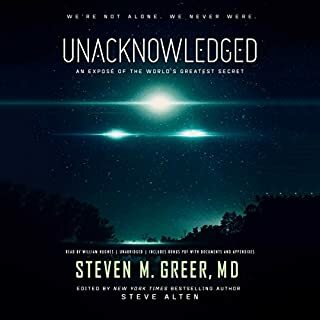 Author did a magnificent job of using extensive research to suggest plausible theories of visits by ancient alien space travelers, tying in legends and history from many different cultures around the globe. 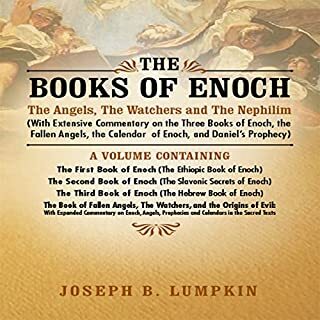 Some of his theories really hit home for me, suggesting explanations of events and circumstances that make much more sense than current poplular beliefs. This book was written many years ago, yet is still timely, and I'm only sorry that I took so long to discover it. The narrator did a wonderful job of giving just the right inflection in his voice, inviting the reader to think. very informative, informarion you need to know! Yes, it has information that people need to hear. Not enough people get a broad view of the world. Von Daniken does a good job of taking history of many cultures and gives us a new way to fit history together. It reads like fiction until you fact check his work. He brings the readers into the story and does a good job of making you feel part of the story. It took me only two sittings to finish the book. If I could have listened to it in one day I would have. This is a must for anyone with a keen interest in this subject the book is informative and very interesting. Erich von Daniken truely brings his theories to life. Easy to listen too, looking forward to listen to more of Erich's work. 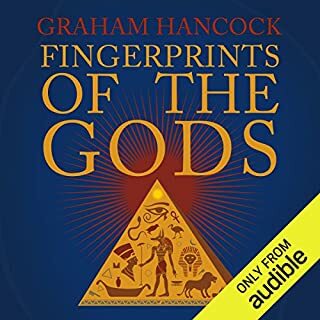 What made the experience of listening to Chariots of the Gods the most enjoyable?